Technical meetings were held, on December 12 through 16 2016, between ABACC and the IAEA in order to discuss the destructive analyses of nuclear materials carried out by both agencies as part of the verification of safeguards. The meetings were attended by ABACC officials, representatives of the laboratories of the ABCCC’s Network and representatives of the IAEA, Dr. David Amaraggi and Mrs. María Teresa Álvarez Diéguez. Dr. Amaraggi, in charge of the tests for the validation of the ABACC-Cristallini Method, reported that he has obtained excellent results. 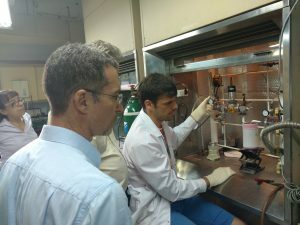 This means a new breakthrough towards the certification of the ABACC-Cristallini Method, attained thanks to the cooperation, the efforts and the dedication of the work team of the participating laboratories.